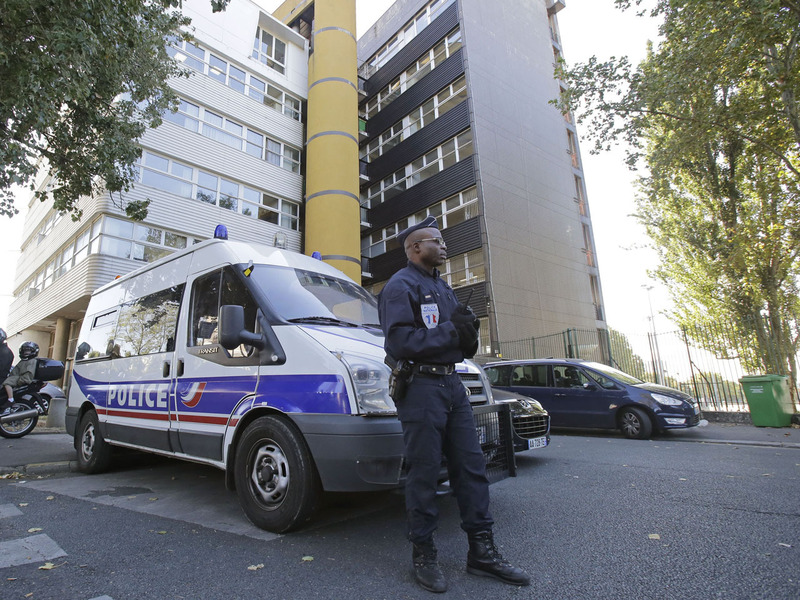 (CBS/AP) PARIS  France stepped up security at some of its embassies on Wednesday after a satirical Parisian weekly published crude caricatures of the Prophet Muhammad. The prime minister said he would block a demonstration by people angry over a movie insulting to Islam as the country plunged into a fierce debate about free speech. The government urged the magazine Charlie Hebdo not to publish the cartoons, but defended its right to do so. The cartoon played off of the U.S.-produced film "The Innocence of Muslims," and riot police took up positions outside the offices of the magazine, which was firebombed last year after it released an edition that mocked radical Islam. CBS News correspondent Mark Phillips reports that the French government has also decided to temporarily close diplomatic offices and schools in 20 countries on Friday, the holy day in the Muslim world which often sees protests form as worshipers pour out of mosques following Friday prayers. The amateurish movie, which portrays the prophet as a fraud, a womanizer and a child molester, has set off violence in seven countries that has killed at least 28 people, including the U.S. ambassador to Libya. The French Foreign Ministry issued a travel warning Wednesday urging French people in the Muslim world to exercise "the greatest vigilance," avoiding all public gatherings and "sensitive buildings" such as those representing the West or religious sites. Government authorities and Muslim leaders urged calm in France, which has western Europe's largest Muslim population. Phillips reports Muslim organizations in France have warned the publication of the cartoon will likely exacerbate relations between Muslims and the rest of the French population, and may provoke further violence around the world, but the groups have called for peaceful demonstrations in France. "This is a disgraceful and hateful, useless and stupid provocation," Dalil Boubakeur, rector of the Grand Paris Mosque, told The Associated Press. "We are not like animals of Pavlov to react at each insult." CFCM, an umbrella group for French Muslims, issued a statement French Muslims to "not cede to provocation and ... express their indignation in peace via legal means." Prime Minister Jean-Marc Ayrault said organizers of a demonstration planned for Saturday against "Innocence of Muslims" won't receive police authorization. "There's no reason for us to let a conflict that doesn't concern France come into our country," Ayrault told French radio RTL. Paris prosecutors have opened an investigation into an unauthorized protest last Saturday around the U.S. Embassy that drew about 150 people and led to scores of arrests. The tensions surrounding the film are provoking debate in France about the limits of free speech. The small-circulation weekly Charlie Hebdo often draws attention for ridiculing sensitivity around the Prophet Muhammad, and an investigation into the firebombing of its offices last year is still open. The magazine's website was down Wednesday for reasons that were unclear. One of the cartoonists, who goes by the name of Tignous, defended the drawings in an interview Wednesday with the AP at the weekly's offices, on the northeast edge of Paris amid a cluster of housing projects. "It's just a drawing," he said. "It's not a provocation." The prime minister said freedom of expression is guaranteed in France, but cautioned that it "should be exercised with responsibility and respect." Foreign Minister Laurent Fabius defended freedom of expression, but warned that Charlie Hebdo could be throwing "oil on the fire" and said it's up to courts to decide whether the magazine went too far. "Freedom of expression can be limited by court decisions. If there is a case of overstepping, it's up to individuals or groups to bring it to the courts, which will say whether the law ... was respected," he said after a Cabinet meeting. Abdallah Zekri, President of the Paris-Based Anti-Islamophobia Observatory, said his group is considering filing a lawsuit but no decision has been made. "People want to create trouble in France," he told AP. "Charlie Hebdo wants to make money on the backs of Muslims." Fabius said that because of the Charlie Hebdo caricatures, embassy security was being stepped up in some countries, and that he had "sent instructions to all countries where this could pose problems." On the streets of Paris, public reaction was mixed. "I'm not shocked at all. If this shocks people, well too bad for them," said Sylvain Marseguerra, a 21-year-old student at the Sorbonne. "We are free to say what we want. We are a country in which freedom prevails and ... if this doesn't enchant some people, well too bad for them." Khairreddene Chabbara disagreed. "We are for freedom of expression, but when it comes to religion it shouldn't hurt the feelings of believers." Charlie Hebdo has courted potentially dangerous controversy in the past. Last November the magazine's front-page, was subtitled "Sharia Hebdo," a reference to Islamic law, and showed caricatures of radical Muslims. The newspaper's offices were destroyed in a firebomb attack just hours before the edition hit newsstands. In 2006, Charlie Hebdo printed reprints of caricatures carried by a Danish newspaper in 2005 that stoked anger across the Islamic world. Many European papers reprinted the drawings in the name of media freedom. Charlie Hebdo has also faced legal challenges. The weekly was acquitted in 2008 by a Paris appeals court of "publicly abusing a group of people because of their religion" following a complaint by Muslim associations. The debate about the limits of free expression spread to neighboring Germany, where Foreign Minister Guido Westerwelle said Wednesday, "I call on all those, especially those who rightly invoke the right of freedom of speech, to also act responsibly. The one who now puts more oil on the fire on purpose, with obvious effect, is not the greatest thinker."